The Choir of St George’s Chapel will sing in concert in the Waterloo Chamber on Tuesday 20 September. Also performing at the same concert will be the London Mozart Players. Pieces by Haydn and Mozart will feature during the evening. On Wednesday 21 September Sir John Tomlinson and the Philharmonia Orchestra will perform works by Mozart, Verdi, Rossini and Wagner in St George’s Chapel. The concert begins at 7.30pm. Saturday 24 September sees a performance of the Orchestra of the Yehudi Menuhin School in St George’s Chapel at 7.30pm. Bach, Arnold and Schubert provide the music to be performed by talented students at the school of the man who co-founded the Windsor Festival. Two evenings of wine tasting will be held in the Dungeon of the Curfew Tower close to St George’s Chapel. Those present will be entertained by Quintessential Voices. The events start at 7pm on Monday 26 and Tuesday 27 September. The Windsor & Eton Choral Society and the Southern Sinfonia will perform Elijah on Saturday 1 October in St George’s Chapel. 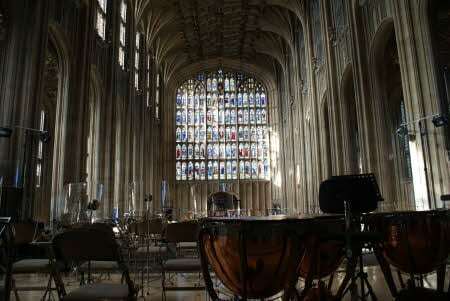 The final Windsor Festival event of 2011 in St George’s Chapel will take place at 2.30pm on Sunday 2 October. Lord Bragg will give a talk on ‘The Book of Books’, the impact of the King James Bible in this its 400th anniversary year. For further information and tickets please contact the Windsor Festival. Booking opens at 10am on 12 July online at www.windsorfestival.com, in person at the information centre in Windsor Royal station and by telephone on 01753 714364. Free Admission to all services at St George’s Chapel. Entry via King Henry VIII Gate.